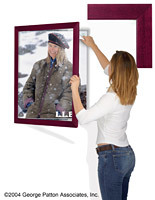 These Picture Frames Ship Fast! 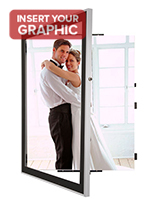 These Picture Frames With Swing Front Include A Black Matboard To Make Your Display Stand Out! 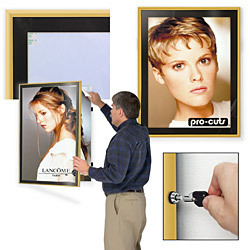 Exchange your 22" x 28" media content, prints or artwork on a regular basis effortlessly with this swinging picture frame. 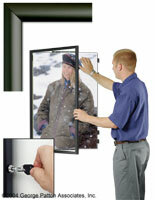 The 1/2" wide satin gold aluminum frame swings on concealed metal hinges to give you full entrance. 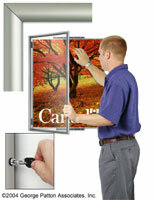 A plunge lock deters meddling so you can be secure putting this in high traffic lobbies or hallways. The aluminum framing contains an acrylic lens to shelter your prints and also accommodates the black matboard. 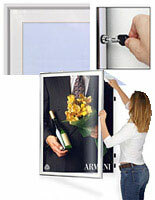 An inner wooden frame supports the duraplast backboard and securely mounts to the wall. 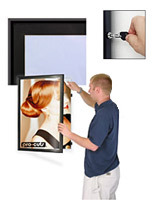 Reusable/removable mounting tabs are provided for mounting prints up to 3/16" thick.